Reality television is all the rage. From American Idol to the Apprentice to Survivor, some people don’t seem to mind being publicly humiliated by a game show host for a shot at the top prize. No matter what your position in life, you can be dismissed without a second thought. However, there are some bits of information a web designer should know in order to achieve a better position –better ranking position in Internet search engines, that is. I'd like to take some time here to explore the basic do's and don'ts of search engine optimization techniques. The higher you rank, the more likely you'll attract people to your site who need your services and also people who are potential supporters of your organization. The first mistake made by most organizations is they pick a couple of generic terms for their service and try to key off those words. Let's assume that a fictitious nonprofit, the Museum of Foolish Fads, wants to drive more traffic to their website. They hope to raise more funds to support the new Parachute Pants display being built. Their director, Mr. Mullet, has tried to get a high ranking for the words "museum" and "fad" but nothing seems to work. The main reason the Museum has a hard time is because museum and fads are so general in their scope that almost everything can fall under them. Google brings up 7,570,000 entries for the term "museum," so Mr. Mullet would have a lot of work to do to get a high ranking there. More importantly, though, the searcher for "museum" is probably more interested in the Louvre. It's important to remember what your ultimate goal is in this process. You don't want people to just see your site; you want people to get involved with it! Therefore, I suggest that Mr. Mullet reexamine exactly who his supporters and patrons are. Also, it's important to remember that people rarely type just one or two words into a search engine. They usually are very specific, so you should be too. In other words, make sure your Web site in some way participates in your agency's primary services or activities. If you're a relief agency, list places and times you will be having a food distribution. If you're a missionary organization, make sure that you have materials available online for missionaries to use in their efforts. If you're an Arts organization, have teaching materials available to help expose youngsters to the wider world of the Arts. Most corporate executives will tell you that any project approved in the boardroom or the president's office is first measured against how well it fulfills on the corporate mission statement. Nonprofits should be just as discerning, if not more so. Your Web site project will be more justified if you can demonstrate that it serves multiple purposes, including serving your clientele. • Look for phrases that describe your nonprofit or its service. "Fads of the 50's" will give you less searchers than "fads" but each one will be interested in your organization - as well as a potential supporter. • Make a list of every phrase you think people would possibly type in to search for an organization like yours and then start eliminating possibilities. • Look at other nonprofits with a similar mission, especially those who achieve high rankings already. The Mood Ring Museum and the Pet Rock Palace may be targeting phrases you haven't thought of yet. • Compare your list to your mission. The more exact the match, the better the phrase, and the more likely you will give a searcher just what he or she wanted. So when your nonprofit gets ready to embark on an Internet strategy, make sure that an integral piece of your Web design includes your mission. It will benefit your project, your constituency, and your bottom line. Now that we have all these great keywords, how do we implement them to get better results? In next month's article, I'll show you some strategies to make sure the search engines are reading your keywords effectively. 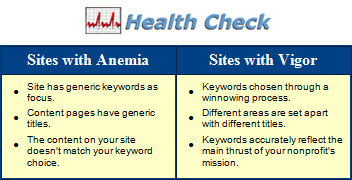 But before you can make keywords effective, you must use effective keywords.